Hello from Capt. Tony Murphy. 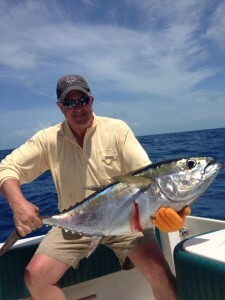 We at the Saltwater Angler wish you a warm and sunny welcome from our little slice of Key West paradise! 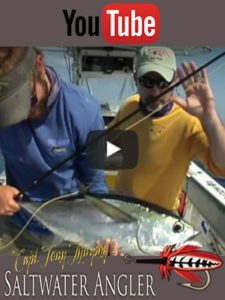 Thank you for your interest in our Key West Fishing Report and Fishing for fishing Key West and the lower keys.! Rain, rain go away! This May has been one of the toughest, weather-wise, in years. The tarpon are here but consistently inconsistent rain and wind make it difficult to find and see migrating fish. Also, along with the migration of tarpon comes the migration of guides who only fish here for a few months out of the year. There isn't a point, flat or channel edge that doesn't have a skiff sitting on it. All of these factors make for a challenging day on the water. But if it was easy it would not be as much fun, and the rewards can be fantastic! If you put your time in and be patient, the right scenario for hooking up will present itself. Always be vigilant and ready to make a quick cast. Anglers must take advantage of every opportunity that comes their way. Line management is key when the wind is a factor. Make sure to have your line stripped in so it lays on the deck of no basket is being used. There are other means of keeping the line in order, like mats and spikes. Remember, if it can go wrong, it will. Keep your head in the game and eliminate all of the little things that can ruin a shot at a big fish. Now we have started seeing nice solid strings on the ocean side beaches and inlets. At first light, happy fish are ready to eat a well-presented fly. As the light gets higher these ocean fish get wary. Try Longer Leaders and smaller, lighter flies to fool these fish. Hint; never hesitate to use a worm fly this time of year. The Palolo worm hatch is on the horizon! Keep your ears open in the afternoons and be ready to head out at a moment’s notice. Bonefish have been consistent at certain tides up to the east. Find good current on a falling tide. Sandy flats should produce some good shots at the bones. Offshore there has been a very good sailfish bite happening. They love the rough water. The guys flying kites have been whacking them. Don't think that small chin-weighted and skipping ballyhoo won't get a strike though!